A summary proposal form completed by John W. Hannah of the Brevard County Planning Department. As Brevard County, Florida, began to experience rapid growth, new studies were proposed in order to figure out how best to adjust to accommodate this growth. The growth of the county was partially due to the expanding tourism industry in Central Florida that was the result of the development of attractions like Walt Disney World. Hannah proposed to investigate the development of analysis techniques for utilization of remote sensing data in urban and regional planning. The investigation would include the east Central Florida region of Brevard County, Indian River County, Lake County, Orange County, Osceola County, and Seminoles County. The data would be presented in reconstituted color infrared and computer-compatible digital magnetic tape formats. 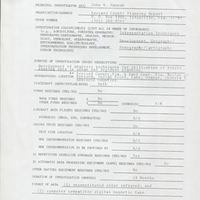 Original summary proposal form by John W. Hannah: Lou Frey Papers, Digital Shared Files, Lou Frey Institute of Politics & Government, Special Collections and University Archives, University of Central Florida, Orlando, Florida. 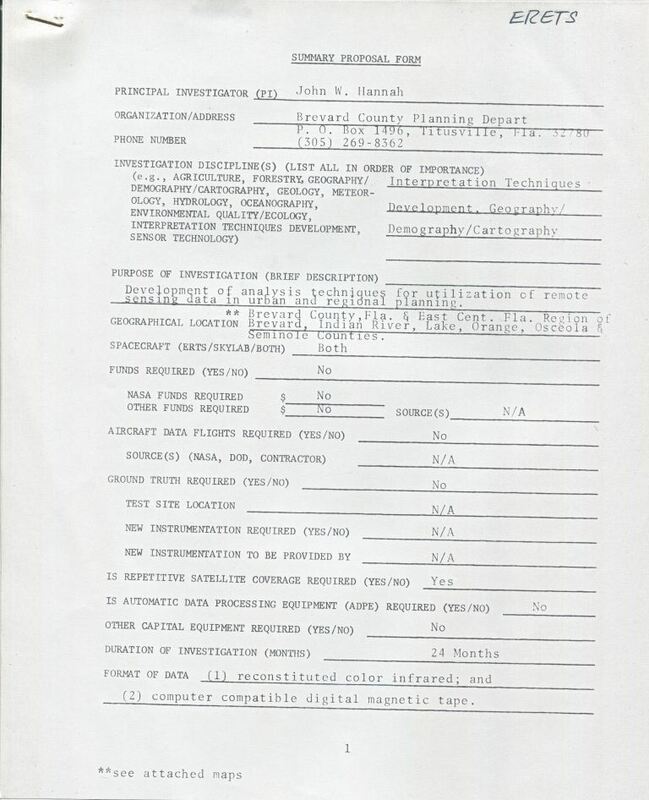 Digital reproduction of original summary proposal form by John W. Hannah. Lou Frey Papers, Digital Shared Files, Lou Frey Institute of Politics & Government, Special Collections and University Archives, University of Central Florida, Orlando, Florida. Originally created by John W. Hannah. Development of analysis techniquest for utilization of remote sensing data in urban and regional planning. (1) reconstituted color infrared; and (2) computer compatible digital magnetic tape. Hannah, John W. . “Brevard County Planning Department Summary Proposal Form.” RICHES of Central Florida accessed April 26, 2019, https://richesmi.cah.ucf.edu/omeka/items/show/3607.